If you're looking for a high-end, expandable and fully configurable NAS device, this isn't it. 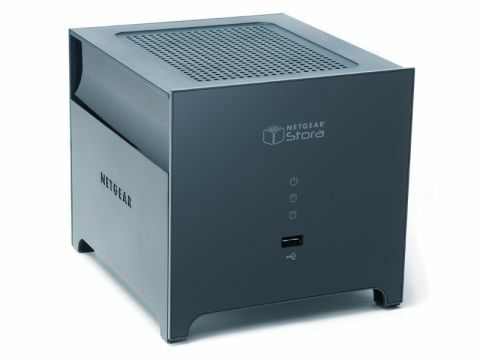 The Netgear Stora MS2110 1TB is all about ease of use and keeping things simple. For example, there are several simple ways to access your Stora box. It pops up as a regular Windows or Samba share on the LAN, has a Windows desktop app and is also available from anywhere in the world via a straightforward web interface. Setting up a web server for sharing photos and movies with friends and securely storing work documents isn't an overly complex task, especially when there are dedicated OSes like Windows Home Server that do it all for you. However, nothing beats the simplicity of the latest generation of network attached storage (NAS) devices, though. These boxes have everything you need for sending photos and streaming videos to trusted friends built in to their web-based front ends. NAS devices are aimed at the non technical audience, simplifying a process that has long been possible, but just a little tricky. Their biggest advantages over cloud services for file sharing is in their speed, flexibility and security. One-touch copying and backup from PC to NAS across your gigabit home network is much less time-consuming than trying to upload a dozen high-res shots via ADSL. Because the interfaces are Flash-driven, all movie content is optimised for streaming too. It's like having your own personal VPN with guest access and a DLNA server included for shunting entertainment around the home, too. Logging in through a browser means going through Netgear's www.mystora.com site rather than directly to your own box. Once you're in, the Flash interface takes a little getting used to, partly because right-clicking icons doesn't work and partly because the theme is very dark. The Stora's biggest problem is that to access the Flickr utility or view your files on a web-enabled phone, you need to pay a monthly subscription of $19.99. That could have been a killer feature if it had been free. At just under £160 for a terabyte NAS device, the brand-new Stora isn't terrible value, either. It's worth pointing out that Buffalo's LinkStation Live II is cheaper, but you can't access your backups from anywhere in the world with that. The only real limitation of the Stora as a NAS device is that only one extra drive can be added in a RAID 1 mirrored array, effectively limiting your capacity expansion options to a USB drive plugged into the front. If you really can't wean yourself off the Facebook or Flickr habit, the Stora also has a one-click upload button for copying albums to either online service. It does rather defeat the point of having all that simple sharing tech built in, but in reality you're still going to want to share photos via social-networking sites rather than going round instructing your friends to log in to your home network. That, coupled with the low upload bandwidth of the average domestic ADSL connection, is why devices like the Stora and Media Hub aren't likely to have much impact on the advance of cloud computing. Providing access for multiple users is something that will always be better done in the cloud. The strength of these devices isn't that your Gran can log in from a cruise ship in the Caribbean, but that you can. They don't replace Flickr or Facebook, but they're a lot better and cheaper in the long run than, say, shelling out monthly for a service like Dropbox or SugarSync. Overall, though, the Stora is a great, secure alternative to cloud services like Box.net.